The Anza Trail in Arizona crosses Public and Private lands. Both of these lands are impacted by weather and human activity most notably during monsoon. The ATCA in cooperation with City and County governments maintains the trail and tracks trail status. Call 520.841.6944 or e-mail info@anzatrail.org to report trail issues. 3/15/2015 - all completed segments are open and hikeable. 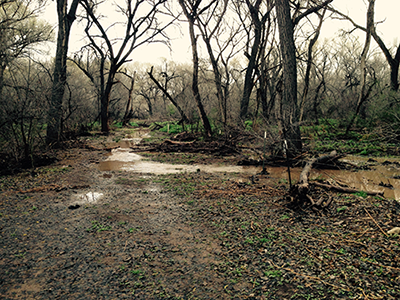 Due to the monsoon and following rains Clark Crossing is still running water and muddy. As you can see Clark Crossing is wet.